Metallica Day, as some media referred to Comic-Con Friday, came to a rapturous close this evening as the legendary metal band tore through a 90-minute set at San Diego’s historic Spreckels Theatre. In town to promote their upcoming film, Metallica Through the Never, James Hetfield, Lars Ulrich, Kirk Hammet, and Robert Trujillo ended a daylong whirlwind of press and interviews by pummeling the crowd of just 1,463 very lucky fans into a joyous, ear-ringing pulp. But after a full day of newspaper articles, video interviews (including a stop at EW.com’s digital suite), and a Hall H panel at the Con itself, the band was ready to let their music speak for them when they took the stage at just before 11 p.m. 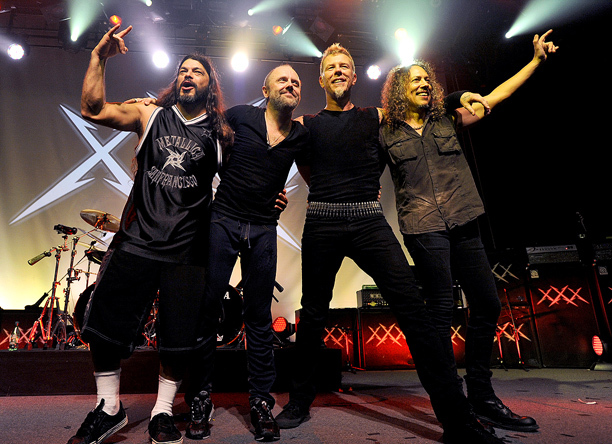 Fans were treated to a 13-song set that relied heavily on their work through the Black Album. It was a celebration of the incredibly heavy and fast songs that made them into international super stars, and the band was clearly having a ball using it to whip the diverse crowd of men and women, young and less-young into absolute delirium. Metallica’s been at this for a while, and they don’t take themselves too seriously. At one point between songs, Hammet clowned on the Comic-Con setting by rocking a few bars of the Imerpial March before leading into the Star Wars theme itself. And during the encore, Ulrich and Hammet briefly switched instruments, the guitar player banging out a rudimentary rhythm while Ulrich laid down a near-passable version of the “Am I Evil” riff. But don’t be confused — this was no light-hearted affair. Even after three decades, Metallica is still as heavy, loud, and relentless as any band today, and that’s why even through all the trials and tribulations (see Some Kind of Monster for details) they still love it so damned much. At their panel earlier in the day, Ulrich said the band hasn’t yet started work on its next album (he said they’ll get to that in 2014), which left tonight wide open for them to tear through classics like the set opener, ”Creeping Death,” as well as “Welcome Home (Sanitarium),” “One,” “Blackened,” “Enter Sandman,” and of course, “Master of Puppets.” It was one huge, bombastic finish after another as the tiny theater (which tomorrow night will presumably have a slightly different vibe when it hosts a Patton Oswalt show) grew louder and louder. Shirts started to come off. Fist-pumping boys in the balcony (who almost certainly were not yet born when Ride the Lightning was released) were punching each other in the chest. Trujillo squatted like a sweaty, bass-pounding anvil next to Ulrich while Hetfield and Hammet broke into a twin guitar groove. It was 1986 again and it was beautiful. Then, after an encore of “Last Caress” (but no “Green Hell”) and “Seek and Destroy” (the only song off Kill ‘Em All that they did tonight), the band thanked the crowd for sharing their evening with them and sent them back out into San Diego’s Gaslamp Quarter and its throngs of over-served bar-hoppers clad in super hero regalia. And tomorrow, Comic-Con will have more deaf long-hairs wandering its midst than it typically does, because Metallica came to the Con this year and dropped a heap of metal on its doorstep. Here’s hoping they make Metallica Day an annual event down here.